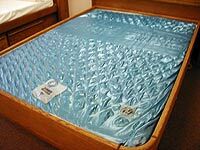 The Luxury Support Mattresses listed below are designed to fit in a wood frame waterbed. 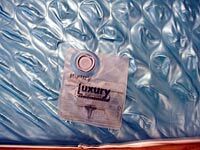 Some features of these Luxury Support Mattresses are Dupont Grade A Quality Fiber, Air Layered Fiber Process, Eezy Burp Valve, Extra Strong Tether Straps, Over-Cut Impression Top, Environmentally Friendly Low Cadmium Vinyl, and 20 Year Limited Warranty. All mattresses are available in California King, California Queen, and Super Single and are covered by our Lowest Price Guarantee! Mattresses, up to 99% waveless. Click on each selected mattress below to view additional details and pricing.